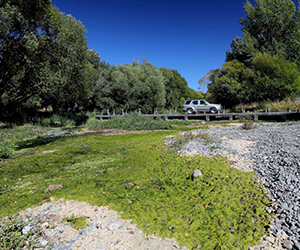 The non-governmental organisation Fish & Game is calling for greater attention to be given to water extraction and minimum flows, following its announcement this week that the Selwyn River at Coes Ford, has completely dried up. “With no water flowing and a couple of algae covered ponds, for all practical purposes the river has gone”, noted the NGO in a press release. According to Fish & Game, the water take restrictions designed to protect the river have not been effective at offsetting the effects of declining winter recharge rates. Despite this, there has been abundant evidence of “widespread irrigation activity”. The proportion of irrigation take relative to the natural level of rainfall recharge has made the Selwyn River far less resilient to traditional drought cycles, explained the NGO. Earlier this summer the river the low flows and high nutrient levels contributed to toxic algae warnings when the algae phormidium was discovered at the ford. Downstream the river has turned phosphorescent green at the Upper Selwyn Huts. The river, which is considered ephemeral, normally resurfaces from the shingle a few kilometres upstream of Chamberlin’s Ford. Its once consistent flow of cool water boasted impressive numbers of trout, making it one of New Zealand’s best trout fisheries.